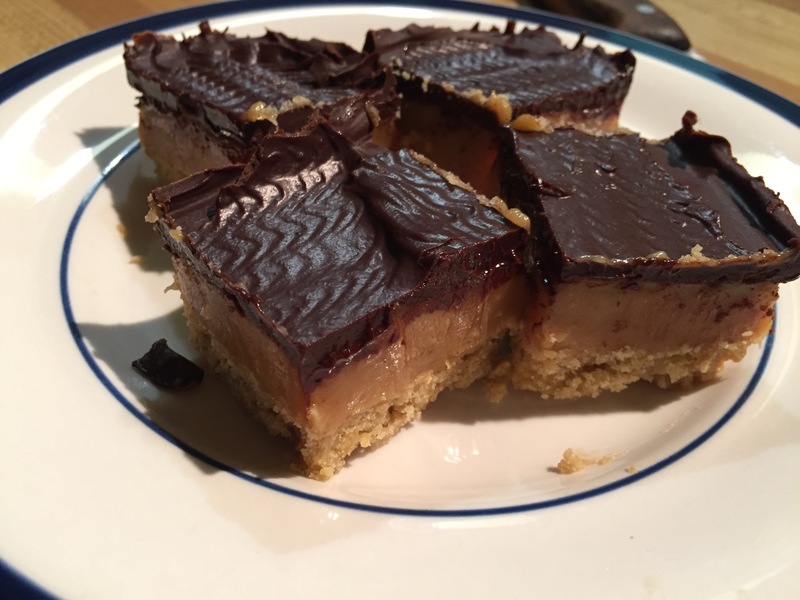 This recipe is a decadent little dessert I discovered on a trip to Scotland one winter. It should be listed under the definition for “comfort food”. ‘Nuff said. Preheat the oven to 350 F /175C. Toast your walnuts in the oven till brown and aromatic, approximately 5 minutes. Grind them in a food processor or chip finely with a knife. Line a 9-inch square pan with aluminum foil, pushing the foil neatly into the corners and up the sides of the pan, using two pieces if necessary to ensure that the foil overlaps all edges (the overhang will help removal from the pan). Spray the foiled pan with non-stick cooking spray or grease with butter. Dump the dough into the prepared pan and press with your fingers into an even layer (dust your fingers with flour if the dough is too sticky). Pierce the dough all over with a fork and bake until golden, about 25 minutes. Set aside to cool. Whisk brown sugar, butter, golden syrup, vanilla and salt together in a medium saucepan over medium heat until the sugar dissolves and the butter melts. Add the sweetened condensed milk, stir until mixture comes to a boil. Attach a candy thermometer to the side of the pan and boil gently, whisking constantly, until the caramel is thick and the temperature registers 220 F, about 10 minutes. Pour the caramel over the warm crust, being sure to spread it into the corners; cool until caramel is set, at least one hour. Place the chocolate and cream in a microwave-safe bowl. Microwave in 15 second intervals, stirring in between, until the chocolate is about 75% melted. Stir, allowing the residual heat in the bowl to melt the remaining chocolate, until smooth (if necessary, place the chocolate back in the microwave for a few more seconds; just be sure not to overheat or the mixture will curdle). Spread the chocolate over the caramel layer, smoothing with an offset spatuala. Refrigerate the bars until the chocolate is set, at least 1 hour. Using the foil overhang, lift the bars out of the pan and transfer to a cutting board. Cut into small squares and serve. Store in the refrigerator. Will keep up to 2 weeks if you for some reason can’t get back to the fridge.